While next year’s election, scheduled for February 16, 2019, is expected to be a keenly contested two-horse race between Incumbent President Mohammadu Buhari and the Presidential Candidate of the PDP former Vice President Atiku Abubakar, it has been a season of media battle amongst all the aspiring candidates, with most of them releasing their economic plans and campaign manifestos, with the citizens greatly anticipating the Next Presidential Debate. The Chairman of the Nigeria Election Debate Group, Mr John Momoh, told news journalists in Abuja on Thursday that the group had fixed January 19, 2019 for a debate for presidential candidates of different political parties taking part in the 2019 elections. It’s unclear whether President Buhari will attend the debate as he did not appear for the 2015 debate because “it was deemed to be unnecessary”. In an interview with news correspondents, the spokesman for Buhari Presidential Campaign Organisation, Mr Festus Keyamo (SAN), said they were yet to decide on whether Buhari would participate in the debate or not. He said once a decision was taken on the matter, it would be made public. “I am not the only one that will take that decision. When that time comes, all those concerned will sit down and take a decision on that and we shall make our decision public,” Keyamo said. 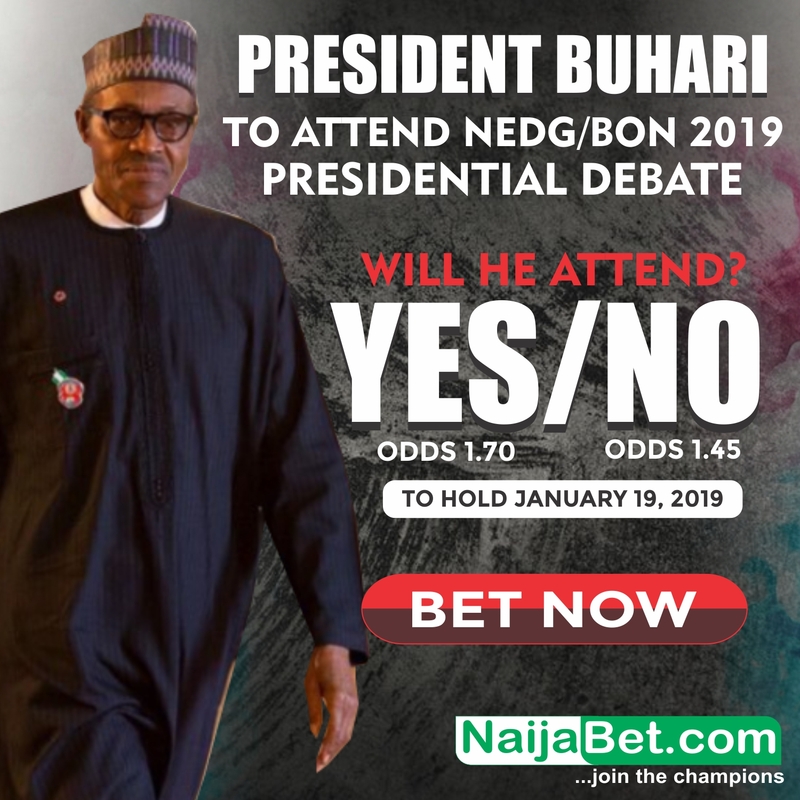 In the light of these, NaijaBet is here again as promised to put a smile on the faces of Nigerians for those wishing to place either a serious or fun political bet on “BUHARI TO ATTEND 2019 PRESIDENTIAL DEBATE, YES OR NO? Good day, thank you for the response. Kindly visit http://www.NaijaBet.com, Click on Politics to place a bet on Buhari to Attend 2019 Presidential Election.